FTSE and DAX exciting new expiry ahead, today’s Ratio Table, levels and comment. When we last looked at the FTSE the zone in January was 6800-6900 and in Feb it was 6950-7050. On rollover Wednesday, the FTSE closed at 6862.68, close enough to the middle of the zone, and the close of Friday, as one can see, would have been where the zone was, so job done really. Now, we come to where the ratios and the zone are now. Firstly, the zone, and although it has dropped to 6750-6850 it could in fact be anywhere between where it is now and where it was last week. So, that means, at the moment, there is precious little ratio from 6750 all the way up to 7050. When you add the Y ratio at either end then we have the potential to have a great expiry with trading range of 350-points, or just over 5%. Boy, do we now regret not doing the rollover for the DAX. Our last comment on this index was back on the 7th Jan, when the market had just closed at 10767. This is worth recalling as the zone then, for the Jan expiry, was still at 10950-11050, so last Wednesday, the rollover, when the market closed at 10931, we thought job done. However, and here’s the regret, we had no idea how bizarre Feb was shaping up to be. As one can see from the table above, the ratios are seriously lopsided, and more interestingly the zone is down at 10650-10750. However, where the zone is concerned, it could very easily flip to anywhere in the Y1 ratio bandwidth. And that’s the issue here, as Y ratio is all there is under the zone. It may not go sour, and the delta ratio of 500% suggests every man and his dog thinks it won’t, but if it does, it could be calamitous. Unless you’re a bear of course. Today, will be the decider we feel, as the proof will be how this market reacts to the R ratios at 11250, and especially at 11300, so, best also pay close attention to any opening gaps. 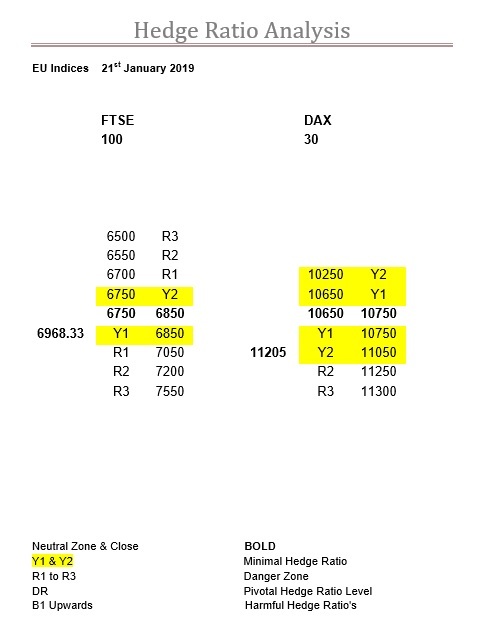 DJX 24100 critical in Jan, Feb scary, rollover table, levels and comment. Significant levels for the SPX , NDX and DJX at the start of the new expiry. Today’s Ratio Table, levels and comment.